There’s a new berry in town. It’s called the Saskatoon, and it’s been growing wild across the prairies of western Canada and the northwestern United States since the buffalo roamed. The Saskatoon “blueberry,” as some catalogs call it, has the same look and nutritional value as a regular blueberry, but with a different, sweet-yet-nutty taste. The plants branch off from the trunk like a clump of birch trees and can reach 20 feet tall and about 4 feet wide. However, Elsner says they can be kept trimmed down for garden production or to form an attractive hedge. The pretty spring flowers make Saskatoons a wonderful landscape plant that doubles as a food source. White blooms show in mid-spring, and the deep-purple fruit appears about July. 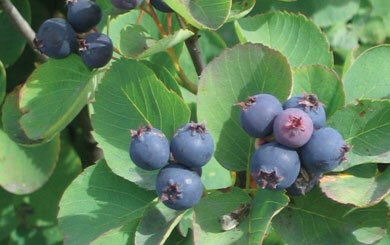 Saskatoons are used for pies, jam, wine, cider and beer, and are good in cereal or trail and other snack mixes. These berries are healthy little buggers, too, as they’re chock-full of protein, vitamin C, calcium, iron and cancer-fighting antioxidants. They’re hardy as a polar bear, growing as far north as Alaska, and do well in most soils, except very wet clay. A similar species, known locally as juneberry, grows wild in our northern lower area and the U.P., mostly in upland, sandy areas. Plant Saskatoons in full to partial sun and light sandy or sandy-loam soil that drains well. In the garden, space them about 3 to 4 feet apart. They’re self-pollinating, but will bear heavier fruit if planted with other Saskatoons. Prepare the soil as for any tree or shrub by digging a hole about twice as wide and deep as the root ball. Back-fill with a mix of compost and good topsoil, water-in the plants well, and then mulch around the trunks. A slow-release or organic fertilizer applied moderately once or twice a year will keep them healthy. Unlike blueberries, Saskatoons don’t require acidic soil. There is interest in this once-ignored berry out East, and Michigan farmers haven’t overlooked them either, Elsner says. In fact, some call it a “super fruit” that is about to take our farm markets and roadside stands by storm. However, the exact amount in production is hard to estimate. Elsner’s best guess is that 70 to 100 acres are scattered throughout Michigan, and MSU will conduct surveys to determine how much acreage is under production and what markets are interested in the berries. Like blueberries and other edibles, Saskatoons are tempting to birds, so using bird netting is worth considering. Rose chafer pests have also found these plants to their liking, adds Elsner, who is also a highly regarded entomologist. He’s working with others at MSU to invent an appropriate insecticide to deal with the chafers. Interest is also picking up on a commercial scale here, and a group has formed to support efforts to grow and market the fruit. “Because of the enthusiasm of local growers, we have started an organization called ‘The Saskatoon Berry Institute of North America’ to support the development of this new crop, which we all feel has a lot of potential,” reports Jim Dixon of Williamsburg, also a Cherryland Electric Co-op member. Dixon has 250 Saskatoon plants in the ground and expects to eventually have berries for the farm markets. If you’re interested in growing Saskatoons, get involved or simply check-in with this enthusiastic group of growers by visiting the Institute on Facebook at facebook.com/SaskatoonBerryInstituteOfNorthAmerica. Where do I find info on how to grow and where to find plants? Thanks! Thanks for reading Michigan Country Lines!